X1 1st Generation Aluminium Boiler Spare Parts. 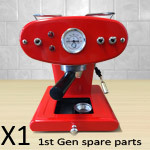 If your X1 is an older version then it has an aluminium boiler inside with different internals to the current X1s. Some of these parts are still available. If there are any parts you require that are not listed please send an EMAIL and we'll get you a price. 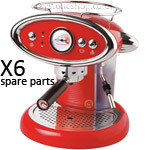 From o-ring seals to heating elements, you'll find all the popular spare parts listed here for your coffee machine. If your machine is tripping the household fuses you'll need a new heating element. If you're having problems with leakage then we have all the seals you'll need. If you want to freshen up your machine, we have water tanks, pipes, drawer fronts and drip trays all available from stock. Consumable items like group head seals, water tanks, handles, spouts and more. If there are any parts you require that are not listed please send an EMAIL and we'll get you a price. TRIO X1, X3 and X6 3rd Generation Brass Boiler Spare Parts. 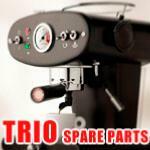 TRIO machines are E.S.E POD only machines. They have a different lower boiler and group head to the GROUND machine. Here you will find parts specific to the TRIO model. The current TRIO models is the 3rd Generation X1 TRIO, previous variants were available in the X3 and X6 body designs. 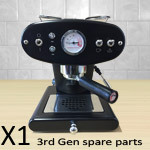 Other generic parts such as: water tanks, pipes, drawers, drip trays, elements and temperature gauges can be found in the X1 3rd GEN product section. 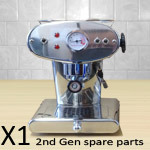 If there are any parts you require that are not listed please send an EMAIL and we'll get you a price. 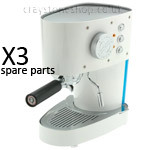 Click here for our list of spare parts and replacements for your X3 machine. Water tank, handles, heating element, temperature gauge and gasket seals. Click here for our list of spare parts and replacements for your X5 machine. X5 parts are still available to order, and it does share components with the X1 range, if there are any parts you require that are not listed please send an EMAIL and we'll get you a price. 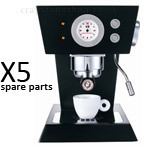 Click here for our list of spare parts and replacements for your X6 machine. Heating element, temperature gauge, steam wand, water tank, handles and seals. 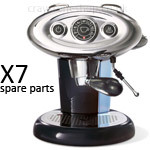 Click here for our list of spare parts and replacements for your X7 and X7.1 machine. Water tank, handles, steam wands and steam wand pannarellos.